Historic New England’s efforts to reduce energy consumption at the Pierce House in Boston’s Dorchester neighborhood are the subject of an upcoming program on October 20. Lastwinter, energy conservation measures were implemented in order to increaseenergy efficiency while staying true to our preservation principles. These measures focused onpreventing air infiltration. In this first round of work, we repointed thefoundation, secured some major holes throughout the building, and added interiorstorm windows. 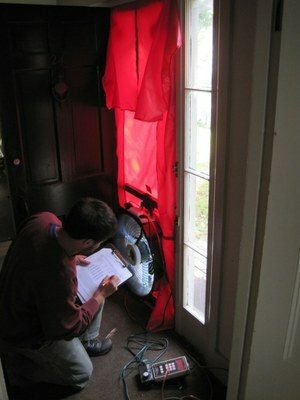 Recently,Historic New England staff re-visited the house to measure airleakage and determine whether our work was effective. We have also begun reviewing our utilitybills to see if our energy costs have decreased. Hear the results of our testing and learn moreabout energy efficiency projects at both the PierceHouse and the Lyman Estate at EnergyEfficiency and the Historic Building: Finding the Balance on October 20. Tosupport ongoing preservation work at our historic properties please consider contributingto the Preservation Maintenance Fund.